The Franco-German (or Franco-Prussian) War of 1870 was the most consequential martial conflict between France and Germany in the nineteenth century. Many cultural and political conflicts between the two nations, however, shaped that conflict and its particulars. French and German master equestrians, to take a pertinent example, clashed in mid to late-century over the proper theory and practice of dressage and equitation, particularly as they pertained to the training of military horses and riders.¹ Their opposed views informed how the respective national cavalries prepared for and performed in battle in 1870 and long after. François Baucher, the controversial French master, stood at the center of this international equestrian dispute. Baucher’s theories, as elaborated in his Dictionnaire raisonné d’équitation (1833) and, especially, Méthode d’équitation basé esur de nouveaux principes (1842) and its many subsequent editions, loomed as the bêtes noires of German dressage theory and practice. The eminent Louis Seeger and his highly influential pupil Gustav Steinbrecht, as we shall see, were foremost in fueling both their written polemics and their school teaching with outright animosity toward Baucher and his followers. Baucher also stood at the center of an intranational dispute that played out no less polemically and much more proximately and personally. 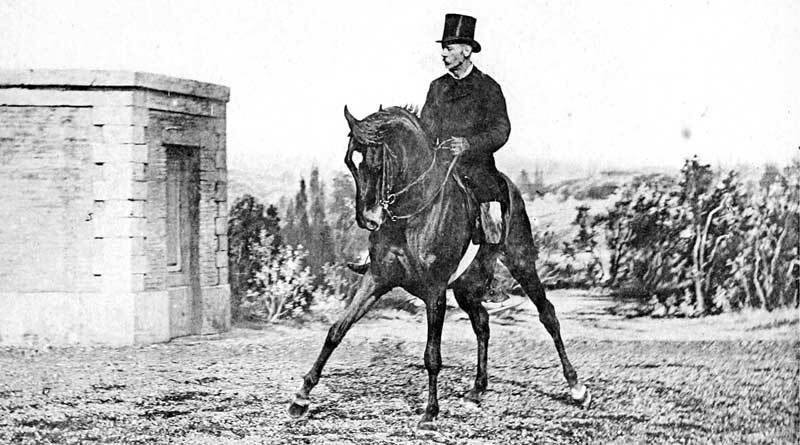 Dom Diogo de Bragança reminds us, in Dressage in the French Tradition, that when Le Comte d’Aure became Écuyer en chef of the Cavalry School at Saumur, following the closure in 1830 of the School of Horsemanship at Versailles, “he put academic dressage to the side, and made a more practical method prevail, [one] in his view more suitable for a military school”(De Bragança, 135). That method, Sidney Felton writes in Masters of Equitation, resulted in “a cross-country and jumping seat based on classical principles” (Felton, 34-35). Baucher’s anti-classical and revolutionary system of academic dressage was soon put to the test against d’Aure’s classical method of l’equitation exteriére (or outdoor riding) — in public view and with vocal partisans on both sides. Though Baucher would lose out to d’Aure in determining the future direction for training military horses and riders at Saumur, his defeat proved only partial. Original and influential successors like Alexis-François l’Hotte, François Faverot de Kerbrecht, James Fillis, and Etienne Beudant would go on to integrate both Baucher’s and d’Aure’s insights into new systems for training cavalry horses. In an Introductory Note to a new edition, Daniel Pevsner notes that Weyrother introduced the Spanish Riding School to the work of François Robichon de la Guérinière, and was “dedicated to the installing, practicing and promoting of de la Guérinière’s principles and equestrian legacy” (Weyrother, 11). The premise of Weyrother’s Fragments, however, introduces a new, critical, and German element: though a horseman “must be aware of scientific principles,” dressage and equitation “cannot create [their] own principles … but must borrow them from elsewhere” (25). Weyrother’s signal and informing insight, based on that premise, is that “the first principle of the art of equitation is taken from statics, the general principle of equilibrium, that is the more the line of force of the centre of gravity falls into the base of the body, the more stable the body will be” (25). Or, as he immediately “clarifies” that principle: “The underlying rule of equilibrium is as follows: the lower the centre of gravity, or the shorter the line of force in relation to the diameter of the base, the more stable will be the body” (27). Weyrother’s method rests wholly on this principle from mechanics. Weyrother begins with equitation, since mastery of riding is prerequisite to mastery of dressing (or training) horses. Since proper equitation presupposes a proper seat, Weyrother starts there, applying his principle of equilibrium: “The vertical position of the pelvis therefore determines the whole posture of the rider, and is thus the basic principle for the seat on the horse … All instruction must be based on this established basic principle and constantly refer back to it” (33). The remaining fragments of Weyrother’s writing are arranged to do precisely that in their advance from teaching a novice rider to mount, to training a green horse to serve. Weyrother’s pupils appended to these fragments a proposal that he had made for the creation of a military institute. Its purpose would be “to achieve uniform practice of equitation in the imperial and royal cavalry,” and its means would be to use school horses to train riders who then could train school horses — training not only in movements for the manège, but also for performance “in the open field … over ditches and fences” (103). For Weyrother, as for others in the Austrian and German traditions, high school and cross-country were not opposed: for exceptional horses, to quote Werner Poscharnigg’s Austrian Art of Riding, the former “crowned” the latter (Poscharnigg, 108). Weyrother’s pupils also contended that his methods led not only to an increase in military equestrian skill, “but also to a substantial reduction in remount costs through appropriate training of the horse” (Foreword, Weyrother, 21). Whether from agreement or loyalty, however, they whitewashed his apostasy from the Austrian School’s (and his own) ideal of the “reflective rider” and commitment to the humane treatment of the horse — a departure that employed not only whip and pain, but also hunger and thirst, to tame “a horse that can no longer be corrected by kindness” (117). Poscharnigg correctly calls this reversion to 16th century methods “crass brutality in order to quickly train a cheap cavalry horse” (Poscharnigg, 108). Poscharnigg also demonstrates more broadly in his fine study how “military and cultural tendencies in 18th century Europe,” culminating in the French Revolution of 1789, led to a general demise of haute école dressage throughout the Continent. Preserving haute école from “artifice,” atrophy, and extinction, the High School in Vienna “passed on its scientific principles to the military” enabling reciprocal training for school, campaign, and terrain riding. “This synthesis of martial equitation and High School,” Poscharnigg concludes, “became the hallmark of Austrian equestrian art well into the 20th century” (Poscharnigg, 40, 96, et passim). As with so much in equestrian history, the path leading from Weyrother to 20th century equitation follows a genealogy of teachers and pupils. Weyrother’s pupil Louis Seeger (1798-1865) was the author not only of System der Reitkunst (System of Horsemanship) (1844), but also of Herr Baucher und seine Künste – Einernstes Wortan Deutschlands Reiter (Mr. Baucher and His Arts: A Serious Word to Germany’s Rider) (1852). Like his teacher Weyrother, Seeger revered the methods of Guérinière. He also deplored Baucher’s upending of them. Seeger’s star pupil, Gustav Steinbrecht (1808-1885), in turn, was author of the brilliant, posthumous, and anti-Baucharisttreatise, Das Gymnasium des Pferdes (The Gymnasium of the Horse) (1886). William Steinkraus, the late giant of international show jumping, asks in his introduction to a new edition: “Who was the author of this book the Germans consider worthy of ranking with Xenophon, Pluvinel, Newcastle, and Guérinière?” (Steinbrecht, ii) The answer — at least Daniel Pevsner’s answer — is: the “father of modern German equitation (see Weyrother, 11). Though clearly the author of the Gymnasium, Steinbrecht actually had left his pupil, Paul Plinzner, with a book still in fragments. “Since he had given me unlimited power,” Plinzner notes in his preface to the first edition, “I had the choice of either publishing the fragments or independently completing them … into a complete whole” (Steinbrecht, viii). He chose the latter course. Plinzner, in turn, charged his pupil, Hans von Heydebreck to carry Steinbrecht’s vision forward, so Heydebreck introduced the Gymnasium’s fourth edition in 1935, adding running commentary on Plinzner’s “deviation” from Steinbrecht’s teachings. Steinbrecht’s treatise, Plinzner wrote, was neither “intended for the layman” nor written as “a guideline for training horses. Instead it attempts to immovably set the goal of the equestrian art, to show what means the horse’s nature gives us to attain these goals, and to explain how a system of gymnastic exercises that we call the training of horses can be assembled through appropriate use of these means” (Steinbrecht, viii-ix) — a concise preçis of Steinbrecht’s lengthy, lucid, and elegant exposition of his system for the gymnastic training of horses. A reader expecting a fusty, Teutonic tome will be pleasantly surprised. Steinbrecht’s book unfolds in five topical sections: the rider’s seat and aids, the purpose of dressage, systematic training of the horse, school movements, and an epilogue. (Plinzer notes that the chapters on the canter, piaffe, passage, and the airs above the ground, as well as the epilogue, “have come exclusively from my pen.”) Its main themes, though detailed and densely interwoven, emerge with clarity. Though Steinbrecht immediately establishes his object as “the working of the horse,” (1), he begins with the training of the rider who must do that working. Everything in riding, he repeats often, depends on “a perfect seat and fine feeling” (18). In order to develop soft hands, that is, the rider first must have a soft seat, and in order to become “one with his horse” and “instinctively use the hand and leg aids at the proper time, ”the rider also must develop feel, or “tact” (137). Proper riding and training, finally, also require fealty to Steinbrecht’s main, and now famous, principle: “ride your horse forward and set it straight!” (66, 185) The reason is simple: “Thrust cannot be regulated if none exists, and the horse cannot learn to move correctly if it does not move. … The horse is a harmonious whole in which the individual parts mutually support one another” (69, 74). In Steinbrecht’s estimation, Baucher’s violation of this basic principle defines Baucherism and damns its practitioners. Steinbrecht’s principles perfectly reflect the zeitgeist of German Romanticism, or, as he succinctly reveals it, “The fine arts produce true beauty only if they stay within the confines of nature” (8). Thus, he urges the trainer to “diligently observe the young, green, horse in the pasture” to appreciate its natural endowments (40); advocates observing “natural principles” and increasing “organic forces” (36, 60); and cautions against using “artificially construed bits or other devices” (44). Classical dressage, in short, seeks only “to develop the horse’s natural gifts to perfection and make them subject to the human will” (23). Steinbrecht’s demand for “scientifically educated” trainers who understand and apply “correct scientific principles” (117, 119) follows from (rather than conflicts with) that adherence to “the laws of nature” (in Plinzner’s phrase), including the laws of statics in equitation that Steinbrecht brought forward from Weyrother and Seeger. Similarly, Steinbrecht’s disgust for “pedantry” and “false erudition” (31, 82), for the degradation of equestrian art to “philistinism and puppetry” (117) follows from his commitment to “the principle that all movements of true, classical dressage have direct or indirect practical utility” (219). Perhaps not surprisingly, then, Steinbrecht also follows Seeger in denouncing Baucher and his method. Baucher is a “quack” (45) whose vaunted originality lies only in the fact that “no-one before him has discredited the noble art in the way he does by working against all its natural principles” (125). Baucherism “consists in … robbing the horse of its natural power,” until the horse, “no longer good for any practical purpose,” is good only for the circus. Valuable only as a warning example, “the Baucher method is a complete system for ruining horses” (80). Baucher, of course, promoted his method as one useful for military purposes, using the circus to demonstrate its effectiveness. He claimed that a principal value of the method was its ability to break and train cavalry horses in record time, a claim seconded by the important British cavalry officer, Lewis Edward Nolan, in his Baucherist treatise, The Training of Cavalry Remount Horses, a New System (1852). For Steinbrecht, the claim is moot: Baucherized horses are ruined horses, no matter the intended purpose or the length of time for achieving it. With proper preparation of cavalry riders and horses as arguably his primary goal, Steinbrecht advances the German and Austrian tradition of employing manège work to the degree appropriate for military riding. Thus, he precisely distinguishes degree of contact, collection, and self-carriage needed by military horses (as opposed to haute école, on one side, and racing, on the other), and how to achieve it. As Plinzner restates Steinbrecht’s thinking, “correct, truly gymnastic dressage training can never unfavorably influence the performance of a horse cross-country” (Steinbrecht, 295). Published for decades in English as Breaking and Riding, Fillis’s Principles of Dressage and Equitation is a classic of horsemanship and a model of lucidity.5 Fillis sets the tone in his admirably clipped preface: he does “not presume to discuss scientific subjects” because he is “simply a horseman” who will draw on “sixty years” of experience. He has derived from that experience the “fundamental principle” that a horse must be “correctly balanced and light in forward movements and propulsion [for the rider to obtain] the most powerful effects with the least exertion” (xi). Fillis then encapsulates the method based on that principle as consisting in “distribution of weight by the height of the neck bent at the poll and not at the withers; propulsion by means of the hocks being brought under the body; and lightness by the loosening of the lower jaw” — adding the jaunty comment that “when we know this, we know everything, and we know nothing.” We know, that is, the “universal” principles, but not yet the proper practical application of them that we presumably will learn from his book (xi). The book unfolds in eleven chapters of varying length and detail. Three of these, “Horse and Man,” “Ordinary Riding” and “High-School Riding,” well exceed half the book’s length, and two others, each a couple of pages long, are more properly appendices than chapters. Of the remaining six chapters, two have special pertinence to our concerns: “Commentaries on Baucher” and “The Army Horse.” So do close, independent, and unexpected alignments between Fillis’s and Steinbrecht’s thinking. With respect to horses, Fillis is unreserved on breeding: “I train only Thoroughbreds for my own use,” and “I unhesitatingly put thoroughbreds above all others, whether for hacking or for high school riding. They are pre-eminently the best for all kinds of work” (1, 142).6 He is equally unconditional on temperament: “Pluck is the best quality in a horse,” and “no amount of training can … give pluck” to a horse lacking it (27, 139); or, put differently: “The supreme quality in every horse is impetuosity,” and “every horse which is not hot is fit only to be put between the shafts” (140). Studiously unsentimental, Fillis finds horses “incapable of affection for man” and indifferent “towards those who tend them or ride them” (4-5); though they possess “particularly acute” memory, they have “but little intelligence” and “cannot reason” (4, 148). The “great point,” it follows, “is to be master … The object of training is the destruction of the free will of the horse” until “the only brain [the horse] has is that of his rider” (67, 107). At the same time, though, Fillis disparages the “new school” that produces only “machines and automatons” (229). There is no contradiction. In a word, “a trained horse is not a machine … but is a living creature … who requires to be constantly kept in the discipline of work” (206n). And that discipline, he repeats often, depends entirely on “appropriate punishment and reward” (33). More, specifically, “the fundamental principle of training” is the immediate application of one or the other, or, as restated many pages later, “the fundamental principle of dressage [is] that reward should follow obedience as quickly as punishment follows disobedience” (61, 91n). With respect to riders, Fillis shares with Steinbrecht both the axiom that only a proper rider can be an effective trainer and that “the supreme quality of a rider” is equestrian tact (237).7 Fillis’s definition of tact maps closely onto Steinbrecht’s in prerequisite (“flexibility of the limbs and a good seat”); effectiveness (“send[ing] to the hind quarters only the amount of force necessary to maintain equilibrium with a maximum of propulsion”); and manifestation (“being able to feel that the horse is straight”) (18, 105, 106). This all comes back to Baucher, about whom Fillis shows more ambivalence than does Steinbrecht. Fillis opens his “Commentaries on Baucher” by calling him “certainly the greatest and most clever high-school rider we have ever had,”adding: “As regards myself, I claim to be a follower of Baucher … Without [him], I would not know as much as I do of riding” (245, 245n). More than a score of previous references to Baucher, however, almost all critical, elaborate one key point: “the work of making the horse to go forward constitutes the great difference between my system of equitation and that of Baucher” (49). Ultimately, Fillis represents his own system — indeed, must represent it — as valuable to the successful waging of war. “Late wars,” he notes, “have proven that cavalry are required to play a decisive part in military operations,” cavalry require trained and obedient horses, and other training methods waste time, effort, and money, still “the chief sinew of war” (172-73). The remount depot, he proposes, therefore must become “a true training school” teaching soldiers equestrian equilibrium and preparing horses through a proper system of dressage (182). Weyrother’s very fragmentary text, with exceptions, has more historical than practical value for the contemporary reader (always the case, of course, when an original thinker’s ideas have exerted such influence that they eventually seem commonplace). Its historical value owes largely to Weyrother’s newly scientific understanding of the principle of equilibrium in equitation — as opposed to its long established intuitive application — and its practical value resides mainly in its exposition of that understanding. Fillis’s fully realized and far more widely read work is a different story. “It is an interesting anomaly,” Sidney Felton writes, “that whereas both Baucher and Fillis greatly influenced the thinking of most civilian riders and authors, Baucher exerted relatively little influence and Fillis practically no influence at all on the development of equitation at the great French School at Saumur” (Felton, 39). Comte d’Aurehad carried the opening battle, and General L’Hotte, subsequently, won the war. Of these three masters, Steinbrecht, in the end, arguably exerted the most profound and lasting influence on both school and military riding. As Richard Williams has observed, German cavalry regulations dating to the 18th century were consolidated in 1882, revised in 1912 and 1926, and published in a 12th version in 1937 as H. Dv. 12 [Army Riding Regulations 12]. The revision of 1912 “introduced Riding Provisions that were substantially the work of Gustav Steinbrecht,”and the revision of 1937, not coincidentally, followed the revised Fourth Edition of the Gymnasium by only two years (H. Dv. 12, ix). Those regulations, in turn, have extended their own, and therefore Steinbrecht’s, influence, even further. As Christoph Hess notes, “after World War II, the teachings of the H. Dv. 12 served as the basis for the ‘Principles of Riding and Driving’ of the German National Equestrian Federation (FN).” And while the FN Principles handbook often has been updated, Hess notes, the “actual core of the content” remains that of H. Dv. 12 (xiii). In a work previously cited, Dom Diogo de Bragança contrasts exactitude as “the primary occupation of the German School” of dressage with beauty as “the primary preoccupation of the French school.” He goes on to say: “The German School, which has always applied the teaching of the Old French School with a view to obtaining great precision in the movements, was in open war with the Baucherism that was presenting a new method to explore every horse’s possibilities” (De Bragança, 132).9 The contrast, though overly stark, rings true in the specific context of dressage as manège schooling. Cavalry reached its high water mark, however, in the nineteenth century. European nations raised and maintained huge establishments, requiring the training of untold thousands of horses and men. Schools of dressage and equitation had to find highly efficient and effective methods to feed the insatiable maw of the military. They had to create mechanistic processes for producing mounts and riders, in effect, who themselves neither were machines nor should become machines. In the end, we must view German exactitude and French aesthetics in dressage, as represented by Weyrother, Steinbrecht and Fillis, through that military lens. This essay was occasioned by the recent republication of Fragments from the Writings of Max Ritter von Werother, The Gymnasium of the Horse, by Gustave Steinbrecht, and Principles of Dressage and Equitation, by James Fillis (all Xenophon Press, 2017). Citations are from these editions. Maxmilian von Weyrother, Anleitung wie man nach bestimmten Verhältnissen die passendste Stangen-Zäumung finden Kann: nebsteinereinfachen Ansicht der Grundsätze der Zäumung (Wien, 1814). When Weyrother’s followers note in their Foreword to the German edition of 1836 that his short career “did not permit him to complete the work, only a few fragments of which remain to be passed on” (Weyrother, 21), they point to a not uncommon problem. While many masters over the centuries codified their theories and practices in systematic treatises, others for various reasons did not produce such work. Masters from Sidney Medows to Federico Caprilli for example, come to us in more fragmentary and mediated forms, such as compilations of unpublished papers, or student notes from training sessions. Felton goes so far as to characterize Clemenceau as Fillis’s “ghost writer”. Hayes was the author of several notable works, including Points of the Horse, published in seven editions between 1893 and 1969. As Richard Williams points out in his “Publisher’s Introduction” (v), the term breaking has come into such bad odor in the 20th century that a literal translation of Fillis’s French title might be preferable. The exception is military work. Fillis thinks “the half bred” more suitable for war because “to make use of a Thoroughbred, one must know more than ordinary cavalrymen do about riding” (172-73n). Fillis’s legerdemain in his defense of Baucher continues as he explains why “Baucher never rode outside: he was “a reformer and consequently a seeker … who devoted all his life to his work in order to show us the way, which was the only thing that interested him.” As a result, though, he developed a system that kept horses “constantly enclosed” and behind the bit and, therefore, not suitable as army horses (254). Similarly characterizing the difference between the German and French schools, Felton writes: “The French willingly sacrifice complete control and subjection of the horse in order to obtain the airy grace of a ballet dancer. The Germans sacrifice the freedom and grace of the French-schooled horse to achieve the precision and the technically exact performance of a drill team or a dancer in a Rockette chorus” (40). De Bragança, Dom Diogo. Dressage in the French Tradition. Rpt. 2005. Trans. by Michael L. M. Fletcher. Franktown, VA: Xenophon Press, 2011. Felton, W. Sidney. Masters of Equitation. London: J. A. Allen, 1962. Fillis, James. Principles of Dressage and Equitation. Rpt. 1890. Trans. by M. H. Hayes. Franktown, VA: Xenophon Press, 2017. Dv. 12: Army Riding Regulation 12 (German Cavalry Manual on the Training of Horse and Rider). Rpt. 1937.Trans. by Stefanie Reinhold. Franklin, VA: Xenophon Press, 2014. Nolan, Lewis Edward. The Training of Cavalry Remount Horses, A New System. London: Parker, Furnivall & Parker, 1852. Poscharnigg, Werner. Austrian Art of Riding. Trans. by Poscharnigg. Franktown, VA: Xenophon Press, 2015. Steinbrecht, Gustav. The Gymnasium of the Horse. Rpt. 1885. Trans. by Helen K. Gibble. Franktown, VA: Xenophon Press, 2017. Von Weyrother, Max Ritter. Fragments from the Writings of Max Ritter von Weyrother. Rpt. 1836. Trans. by H. J. Fane. Franktown, VA: Xenophon Press, 2017.